ESI Scheme is govern by the Employees' State Insurance Corporation, implemented as per the ESI Act 1948. Drawing Salary/wages upto Rs.21,000/- per month. ESI Corporation has extended the benefits of the ESI Scheme to the workers deployed on the construction sites located in the implemented areas under ESI Scheme w.e.f. 1st August, 2015. Employer contributes 4.75% of the wages. Employees' Contribution is 1.75% of the wages. Employees, earning less than Rs. 137/- a day as daily wages, are exempted from payment of their share of contribution.Employers will however contribute their own share in respect of these employees. It is Statutory obligation of the employers on which ESI Scheme apply under the ESI Act, 1948 , shall comply the provisions of the Act and Register their Factory/ Establishment under the ESI Act within 15 days from the date of its applicability. Enrolment of all eligible employees on its rolls (regular or contractual) – wages upto Rs 21,000 at the time of joining the establishment. And take a print out of the Temporary Identity Certificate (TIC). On linking of Aadhar with IP insurance number, TIC will automatically be converted into a Permanent Identity Card (PIC). With PIC the IP and his family members can avail benefits under the ESI Scheme, without any hitch. Employer contributes 4.75% of salary ( Basic +DA+ Retaining allowance) and Employees Contribution 1.75% which is deducted from employee's salary deposit with ESI Account within the due date. Every month Employer file ESI return online with details of Employee, salary and ESI contribution amount within the due date. The total amount of contribution (Employer and Employee) is to be deposited in any branch of SBI by ONLINE generation of a challan through ESIC portal using his credentials. ESIC has facilitated payment of ESI Contribution online by employer via the payment gateway of 58 banks in addition to SBI. File half yearly return and report to ESIC authorities if there is any change in business activity, address, ownership and the management, maintenance of registers and records etc. 1. Wage record and books of Account maintained under other laws. 4. The immediate employer is also required to maintain the Employees’ Register for the employees deployed to the principal employer. There is no time limit in PF ACT to keep the records. It is suggestible preserve records for atleast 7-10 years. Enrolment of all eligible employees. Deduct ESI from Employee's Salary 1.75% and Make own contribution 4.75%. Our Consultant first give on call consultation about the Process of Registration with the Authority, Guidelines and Documents requirement. Our Expert prepare your application and co-ordinate with you for all the relevant employee data and documents requirement. As soon as your documents reach to us and your application is processed properly, we start processing your ESI Registration and submit to ESIC online. For new employer registration, first step is Signup on ESIC website with Company Name, Principal Employer, State, Region, Email ID and Mobile No. Once you Login and process for New Registration, Select your Establishment Type:- 1) Factory or 2) Shop Establishment and Proceed for next. Once Application fill up is complete and all Particulars correctly disclosed in the form, next work is upload all relevent documents and attach DSC of the employer. Finally submit the form and View/Print the Registration Letter (C-11) and this is also send to your Email ID. The C-11 is a computer generated letter and does not require any signature and can be used as a valid proof of registration of the unit under ESI Act. If Employer Nature of works comes under below category then, Employer need to file Advance contribution of 6 months estimated ESI while registration. After submitting registration form system will show success screen. What are the benefits of ESI registration for Employee? 5. Death benefit (death while on work) - 90% of salary is given to his dependents every month after the death of the employee. Restaurants or Hotels only engaged in sales. having 10 or more ( 20 or more in some states) workers working and drawing salary/wages upto Rs 21,000. 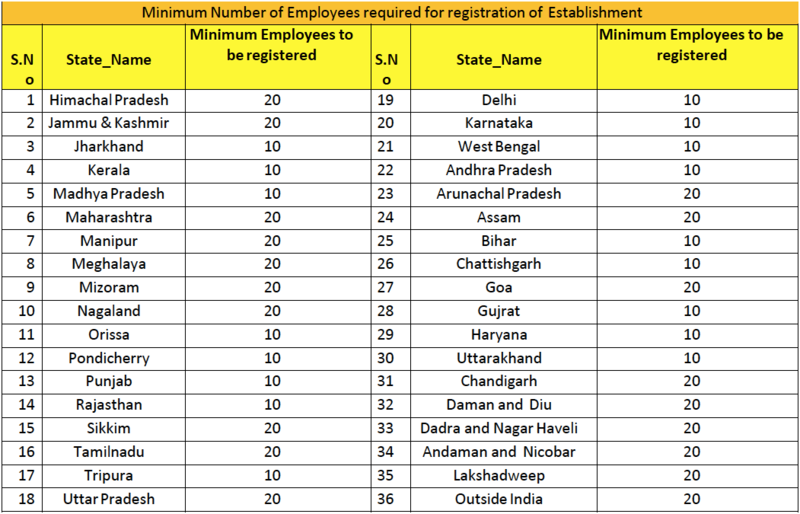 When and How to Register all Eligible Employees with ESIC? to collect all eligible employee and his family members details, Photograph, Aadhar Card( if any) or any other Address and ID proof of Employee and preferably Any Valid documents supporting the proof of relation between employee and his family members. to register every individual employee. The insurance number generated On-line is to be used throughout his life time irrespective of change of employment including change of place/establishment. Submit Employee details online with Employer Login. to update employee details in the ESIC Portal for any changes in his residence/ dispensary/ employment. On linking of Aadhar with IP insurance number, TIC will automatically be converted into a Permanent Identity Card (PIC). With PIC the IP and his family members can avail benefits under the ESI Scheme, without any hitch. If Aadhar number of IP/family is 10 not available, then employer will ensure to affix the IP photo along with the family members on TIC duly authenticated with his stamp & signature. As soon as possible but not later than a month, the insured person along with his entire family should link their Aadhar number using the web site www.esic.in for availing medical benefit at dispensary/ hospital and availing cash benefits at the ESI branch Office. What do you mean by salary for this ESI purpose? Salary or Wages is Basic Pay plus Dearness Allowance (DA) plus Retaining Allowance. No, You don't need to be physically present for the process. process is 100% online. What if ESI registration is not done? As per the Rule within 15 days of ESI Scheme applicability on employer, it is the legal obligation of the employer to get register with ESIC and Get Insurance number of all employees drawing monthly salary upto RS 21,000. PENALTY APPLY FOR DELAY REGISTRATION. Is Permanent Account Number compulsory for Registration of ESI? Is Digital Signature of Employer is Mandatory in ESI Registration and Return Filing? Yes. Class 2 DSC required of employer for ESI registration and to file all return. How PF is deducted from salary? For ESI deduction, the maximum limit of salary of the employee is Rs 21,000 per month. This means that even if the employee's salary is above Rs 21,000, the employer is liable to contribute only on Rs 21,000 that is Rs 998. Can an eligible employee, choose not to contribute to EPF? No. As per the provisions of the ESI Act 1948, Act, no eligible employee has the option of staying away from the contribution. It is mandatory to contribute to the fund, if the establishment and employee both are coming under the provisions of the Act. What is the time limit for Payment ESI Contribution? Within 21 days of the last day of the month in which contribution is due for the wage period. What is the mode of payment of ESI Contribution? What is the penalty for delay payment of ESI Contribution? What are consequences of non / late payment of employees' contribution deducted but not paid? Any sum deducted by the Principal employer from wages under the ESI Act shall be deemed to have been entrusted to him by the employee for the purpose of paying the contribution in respect of which it was deducted as per Section 40 (4) of the ESI Act,1948. Non-payment or delayed payment of the Employee's contribution deducted from the wages of the employee amounts to ' Breach of trust' and is punishable under IPC 406, 409 and also an offence u/s 85 of ESI Act. Who all employees covered under the ESI Scheme? A) Directly employed by the Principal employer, on any work of the Factory or establishment within the premises or elsewhere, or in any part, department or branch dealing with administration, purchase of raw materials, sale or distribution of the products of the factory or establishment. > Employees lent or let on hire to the principal employer on any work of the factory, or employees/professional on contract of service. > Paid Directors of a company. (2) An employee drawing wages above the ceiling for coverage prescribed by the Central Government. Employees/ Professionals rendering services for contract for service. (3) Employee in paying his contribution is whose salary is less than Rs. 100/- per day. How many returns are filed every year after the registration is finalised? Whether Over time payment to be included for calculating wage ceiling limit for coverage of an employee? No. Overtime is not includable for calculating the wage ceiling limit for coverage of an employee. But, it is included for payment of contribution to cover the risk during the period of overtime work, and to enable receiving cash benefits at an enhanced rate also. How wages are computed for payment of contribution? The following wage components are taken into account for computation of wages for payment of contribution. b) D.A/ HRA/ CCA/ Overtime/ officiating allowance/ Night shift allowance/ efficiency allowance/ Heat, Gas, Dust allowance/ Education allowance/ Food & Tea allowance/ conveyance allowance; Overtime wages (but not to be taken into account for determining the coverage). h) Collection Bhatta paid to running staff. Production incentive, Bonus other than statutory bonus, night shift. Heat, Gas & Dust Allowance, Meal/Food Allowance. i) Actual payments made towards leave salary, lay off compensation, or wages for strike period. j) Any other remuneration paid or payable in cash to an employee if the terms of contract of employment, expressed or implied were fulfilled. The above are only indicative. What is a Code number? It is a 17 digit unique identification number allotted to each of the factory/establishment registered under the provisions of the Act. Such a number is generated through ESIC portal on submission of the pertinent information by the employer. It can also be generated on receipt of Survey Report from the Social Security Officer. What is a Sub-code number? This is also a unique identification number allotted to a sub-unit, branch office, sales office or Registered Office of a covered factory or establishment located in the same State or different State. The employer can register any Branch or Sales Office through ESIC Portal using his credentials and his unique primary registration code number. Is there any provision for 'exemption of a factory or establishment' from ESI coverage? Yes, of course the exemption is permissible from operation of provisions of the Act subject to the condition that the employees in a covered factory or establishment are other-wise in receipt of benefits substantially similar or superior to those provided under the ESI Act. The appropriate Government may grant exemption to such factory or establishment for a period of one year at a time prospectively in consultation with ESI Corporation. An exempted application unit has to apply for renewal three months before the date of expiry of the prior exemption. What is the effect of increase in wages from a retrospective date? need to pay the contribution on the arrears for the period prior to the month of declaration/ announcement/ agreement. Who is a Principal Employer? (v) Manager of the factory under the Factories Act, 1948. (ii) The Head of the Department (In the absence of specified Authority). (C) In the case of other establishments: Person responsible for the supervision and control of the establishment. What is the wage ceiling limit prescribed for coverage of an employee? The wage ceiling prescribed for coverage of an employee is Rs. 21,000 per month w.e.f 01.01. 2017. However, there is no wage ceiling for coverage of an employee with 'disability' 01.04.2016. What is 'Average Daily Wages'? Average daily wages means the aggregate amount of wages payable to IP/IW during that period divided by the number of days for which such wages were payable. Who is an 'Exempted Employee'? An employee who is not required to pay employees' contribution is called an exempted employee. The exemption limit with effect from 14.6.2016 is Rs. 137/- per day. However, employer's contribution is payable on these wages. What are the contribution periods and benefit periods? The financial year from April to March has been divided into two halves six monthly contribution periods i.e. first half from 1st April to 30th September and second half from 1st October to 31st March of next year. The relevant benefit period corresponding to each contribution period commences three months after the end of the that contribution period i.e. Jan to June and July to December. What is the Concept of Employees State Insurance behind its applicability started in India? Employees’ State Insurance Scheme of India is a multi-dimensional Social Security Scheme tailored to provide Socio-economic protection to the 'employees' in the organised sector against the events of sickness, maternity, disablement and death due to employment injury and to provide medical care to the insured employees and their families. The scheme provides full medical care to the employee registered under the ESI Act, 1948 during the period of his incapacity, restoration of his health and working capacity. It provides financial assistance to compensate the loss of his/ her wages during the period of his abstention from work due to sickness, maternity and employment injury. The scheme provides medical care to his/her family members also. What is the coverage of ESI Scheme in India and Its journey? In the beginning, the ESI Scheme was implemented at just two industrial centers in the country in 1952, namely Kanpur and Delhi. There was no looking back since then in terms of its geographic reach and demographic coverage. Keeping pace with the process of industrialisation, the Scheme today, stands implemented at over 843 centres in 33 States and Union Territories. The Act now applies to over 7.83 lakhs factories and establishments across the country, benefiting about 2.13 crores insured persons/ family units. As of now, the total beneficiary stands at over 8.28 crores.